I’d like to welcome, B.R.A.G. 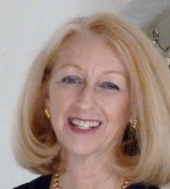 Medallion Honoree Elaine Russell to talk with me today about her book, Secret of the Ruby Elephant. Hello, Elaine! Thank you for chatting with me today and congrats on the B.R.A.G. Medallion for your book, Martin McMillan and the Secret of the Ruby Elephant. First, tell me how you discovered indieBRAG and how has your self-publishing experience been thus far? It was a lovely surprise when an email arrived from InideBRAG announcing that Martin McMillan and the Secret of the Ruby Elephant had received a B.R.A.G. Medallion. I had not heard of the program previously, but I believe the book was selected due to the four 2013 awards it received: Winner Indie Reader Discovery Award, Silver Independent Publishers Book Awards, Finalist National Indie Excellence Awards, and Finalist Foreword Review Book of the Year Awards. I have self-published four books to date: two books in the Martin McMillan series (the first was previously published by a small press), a young adult novel Montana in A Minor, finalist in two 2015 awards, and one adult novel Across the Mekong River, winner of four 2013 awards. I am very happy with my decision to self-publish despite the many challenges of marketing the books. My adult novel, Across the Mekong River, has fared the best in terms of exposure and ebook sales. It is more difficult to sell children’s books as sales are mostly through book stores, which are reluctant to carry self-published, print-on-demand books, and the Scholastic school sales program. Please tell me a little about your book. Kirkus Reviews said of Martin McMillan and the Secret of the Ruby Elephant, “A middle-grade adventure story with plenty of action and an engaging plot, which may appeal to fans of the Indiana Jones movies.” The novel is the second installment in a middle-grade (ages 8-13) mystery series (the first is Martin McMillan and the Lost Inca City). Thirteen-year-old Martin and his friend Isabel skate their way through this fast-paced adventure, traveling from Chicago to Thailand to solve the theft of the Ruby Elephant. The 15th century Thai statue is part of a mysterious legend that holds the secret to a hidden treasure. The friends must decipher a complicated puzzle of clues found in Buddhist symbols and ancient ruins, as they track down the thieves and try to stay out of harm’s way. Tell me a little about Martin and Isabel. What is a challenge or adventure they face together? Martin, thirteen, has spent his life growing up in different locations around the world as his parents worked at different archeological excavations. In the first book he met Isabel at an Incan dig in Peru where her mother worked as well. An avid skateboarder, Martin is focused on the next great place to skate and landing new tricks. He is bit oblivious at times and not the bravest person, but when circumstances require he rises to the occasion. Isabel, also thirteen, has a Spanish mother and American father who are divorced. She splits her time between the two countries. Smart and inquisitive, she often initiates the pair’s escapades, prodding a somewhat hapless Martin to follow her lead. When things get difficult, she turns to Martin to get them out of trouble. In this second book of the series, Martin and Isabel team up with their new Thai friend Junya to find the thieves of the Ruby Elephant. They defy the orders of Martin’s parents and Junya’s grandfather to stay out of the investigation, spying on the suspects and gathering clues for solving an ancient puzzle that leads to a hidden treasure. It takes daring and cunning to decipher the clues with the thieves hot on their trail. How did you come to set the story in Chicago then Thailand for your story? I chose Chicago for the McMillan family’s home base as it has the wonderful Field Museum of Natural History and major universities where Martin’s archeologist parents could be employed. I was a history major as an undergraduate and love traveling to other countries to learn about the history and people. Thailand appealed to me for its rich background and intriguing culture. On several trips to Thailand I visited the locations in the book and gathered bits information and fun events to use in the story. What is the history Ruby Elephant? The Ruby Elephant in the story is based on a gold elephant adorned with multiple gems that is found in the National Museum of Bangkok. While the legend of the Ruby Elephant is fictional, parts of the story are based on real events in the 15th century wars between Ayutthaya (Siam) and Burma. The thieves steal the Ruby Elephant as it holds the answer to a missing treasure. What would you hope for middle-grade readers to come away with from your story? I hope middle-grade readers will find the story fun and exciting and capture their interest in Thailand. In this digital age, children’s lives have become very insular. They need to be introduced to the big, interesting world out there. I wrote the first Martin McMillan book when my son was ten year old. He was a good student, but it was hard to find books that held his attention and inspired him to read more. I wanted to write a book that would be fast paced and fun for reluctant readers. Like Martin, my son and his friends were avid skateboarders, and provided lots of fodder for my story. I planned on writing a series, although it took me more time than expected to get to the second book. The Ruby Elephant continues Martin and Isabel’s adventures, but is a stand-alone story. How long did it take to write your story and where in your home do you like to write? I worked on the second Martin McMillan book for about two years on and off. I had helpful critiques from agents and editors through SCBWI conferences and from other writers who reviewed early drafts. I write at home in my office or anywhere I can find a quiet spot. I am very lucky to spend a fair amount of time on the island of Kauai where I get a majority of my writing done. I am very lucky to have a friend, Jackie Pope, who is a wonderful artist. She painted the cover art for me of the Ruby Elephant on display in the Field Museum exhibit. CreateSpace completed the cover design with my and Jackie’s input. Martin McMillan and the Secret of the Ruby Elephant is available by order from local bookstores and on all major online outlets: Amazon, Barnes & Noble, Smashwords, Apple, Kobo etc. I recently completed a third book in the series, Martin McMillan and the Sacred Stones, which is set in Scotland. It involves a mystery surrounding the Calanais Standing Stones on the Isle of Lewis and the discovery of Druid artifacts. I hope to have it published this coming fall. I also have started work on a new adult novel set in Denver in 1901. After graduating with a BA in History from the University of California, Davis, and an MA in Economics from California State University Sacramento, I worked as a resource economist and environmental consultant for over twenty years. In 1993, I also began writing fiction for adults and children. My early publications included a number of short stories in small literary magazines and a story sold to Highlights for Children magazine. The first book in my middle-grade adventure series, Martin McMillan and the Lost Inca City, was published in 2004. It is now in a second edition since 2012. I became interested in the large Hmong immigrant community in Sacramento after meeting children in my son’s school and reading Anne Fadiman’s The Spirit Catches You and You Fall Down. This led to the short story “Sky King,” about a Hmong-American family, which was published in the literary magazines Red Wheelbarrow (Summer 2004) and The Armchair Aesthete (Fall 2004). It also won First Place for a Short Story in the WIN-WIN Conference 2003 Persie Writing Contest. I began writing my adult book, Across the Mekong River, shortly after this. Before publication, the novel was a finalist in the Carolina Wren Press 2010 Doris Bakwin Award for adult novels, the Maui Writer’s Conference 2003 Rupert Hughes Prose Writing Competition, and the Focus on Writers 2001 Friends of the Sacramento Library Awards. The novel also won four 2013 independent publisher awards after publication in 2012. 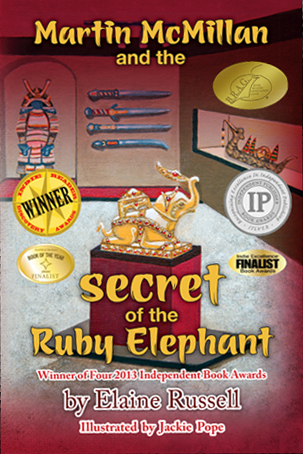 I published the second middle-grade book Martin McMillan and the Secret of the Ruby Elephant in 2012. It won four 2013 independent publisher awards as well. My most recent publication is the young adult romance novel, Montana in A Minor, released in 2014. It won an award from the Friends of the Sacramento Library Awards in 2010. Since publication it has been selected as a finalist for the Readers’ Favorites 2014 awards. I am married with three grown children and two grandchildren. I currently live with my husband in Sacramento, CA, and part time on the island of Kauai. We are delighted that Stephanie has chosen to interview Elaine Russell who is the author of, Secret of the Ruby Elephant our medallion honoree at indieBRAG . To be awarded a B.R.A.G. Medallion TM, a book must receive unanimous approval by a group of our readers. It is a daunting hurdle and it serves to reaffirm that a book such as, Secret of the Ruby Elephant, merits the investment of a reader’s time and money.